Each year in May, leading academics, national and international policy-makers, judges, legal practitioners and NGO representatives gather in London to discuss topical issues of the world trading system. London's Annual WTO conference, organized jointly by the British Institute of International and Comparative Law and the Institute of International Economic Law at Georgetown University Law Center, has grown into the most important annual event of its kind in the field. 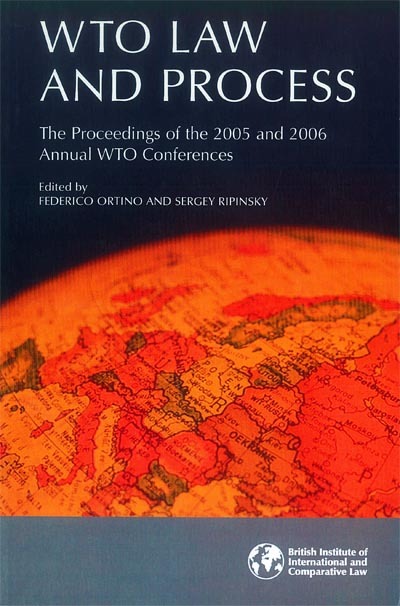 This book collects the presentations and discussions at the last two Annual WTO Conferences in 2005 and 2006. Each conference addressed a broad range of topics relating to the WTO dispute settlement system (such as treaty interpretation, the Appellate Body's role in public international law, the relevance of non-trade interests and values, challenges of compliance, the principle of judicial economy) as well as broader institutional and constitutional issues facing the WTO (such as the impact of WTO disputes on the Doha negotiations, the relationship between trade and investment disputes and the role of the WTO in regulatory convergence). This publication seeks to preserve the abundance of insights and ideas that were shared by very distinguished experts in the field as well as recording the ensuing debate on these interesting and complex topics. "WTO Law and Process (2005-2006)"